Revered punk-rock project Reggie and the Full Effect will release their 7th studio album, “41” on February 23rd 2018 via Pure Noise Records. Serving as the solo project for Get Up Kids keyboardist James Dewees since 1998 Reggie and the Full Effect blend synth infused rhythms with a driving punk rock ferociousness which creates the perfect foundation for Dewees gravely vocal style. With almost a five year lapse between Reggie’s 2013 release “No Country For Old Musicians” and their latest offering “41” I was quite anxious to hear what Mr. James Dewees had in-store for listeners this time around. Clocking in at 53 minutes “41” is a very deep and heartfelt album that is brimming over with emotion. Tracks like “Broke Down” and “New Years Day” hit hard lyrically as Dewees pulls directly from some very personal experiences. The album has plenty of lighter moments as well including tracks like “Karate School” the interstellar instrumental “Channing Tatum Space Rollerblading Montage Music” and “Trap(ing) Music” an industrial powered behemoth featuring James’ alter ego Klaus and Common Denominator which will surely have you chanting the comical chorus before the end of the song. From start to finish “41” is the type of album I really enjoy listening to. From light to heavy and touching on all points in between both emotionally and stylistically “41” has something for everyone. Having listened to the album from start to finish several times over before writing this I just couldn’t and still can’t stop playing it. With 2018 just starting do yourself a favor and grab a copy of this album as I think its definitely going to be one of the bright spots in music this year. Be sure to check out our exclusive interview with James Dewees here for more info on the album. 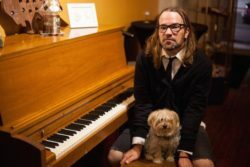 Reggie and the Full Effect is the solo project of Get Up Kids keyboardist James Dewees. 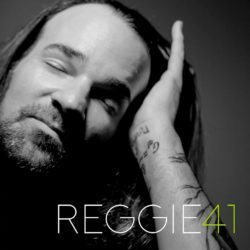 On February 23rd Reggie releases their first album in four years simply titled “41”. Media Mikes spoke with James recently about the albums deep subject matter, the return of James’s alter-ego Klaus and the bands upcoming tour with Senses Fail which kicks off on February 27th. Adam Lawton: Can you give us some background on your new album “41”? James Dewees: I started working on the music just after the release of “No Country For Old Musicians”. During that time there was stuff going on with Get Up Kids and I was working with Gerard Way as well. I tend to do a lot of projects as I find while I am working on those projects I come up with ideas that could be songs for Reggie. The music came about pretty well as I started with about twenty or twenty five demos. For the lyrics I was sort of fishing around and trying to decide what type of record to make. It came down to when I found out my mom was diagnosed with lung cancer and my mother in-law at the time was diagnosed with leukemia. That next year was really just me traveling back and forth to Missouri to be with my mom and then back to Long Island for my mother in-law. Basically I was just going to doctors appointments all the time. I would do a couple shows here or there to make some money but then I would go straight back to the hospital. These events were where the lyrical content ended up coming from. My mom passed on April 9th and then my mother in-law passed away on May 9th. It was a really heavy and emotional time that made it seem pointless in trying to do my silly, funny project. Things were just a big bummer. After about the first year of that I started writing lyrics that were more about what I was going through. This was my way of going through the stages of grief. On the record there is stuff that is kind of funny then some that’s more serious, sad and angry. Music has always been my escape and it’s something that I really enjoy doing and it helped me get through all the stuff I had going on at this time. AL: Being that you didn’t start writing until a year or so after those passing’s what was it like diving back in and reopening those wounds? JD: I cried in the studio a lot. Trying to sing songs like “New Years Day” and “Next Time with Feeling” which are really heavy songs was difficult. Whenever I would revisit those feelings and I would remember something else about that time that I had forgotten. I did the record with Ray Toro from My Chemical Romance who is a really close friend and it was very personal and private with just him and me working on the album. This made it where it was ok to cry and be upset and I had a friend there to support and encourage me. He pushed me to keep going even during difficult times. AL: The album also features a new track from Common Denominator. Can you tell us about that track and when/if we will finally get a full length release from Klaus? JD: With the popularity of Trap music I thought it would be really funny that with Klaus coming from Finland he didn’t know what it was and believed it was about trapping animals. Instead of singing about drugs and whatever he is singing about trying to catch animals. I have played around with the idea of doing a whole album but every time I have started it things just don’t come together. The thing with Common Denominator is that it can’t be thought about too much. The music has to be written in about twenty minutes and if possible recorded in twenty minutes. You really can’t write the lyrics to much. You just have to start recording and see what comes off the top of your head otherwise I think it loses the humor. AL: Can you tell us about the latest single off the album titled “Karate School”? AL: The band heads out on the road with Senses Fail on February 27th can you tell us about that? JD: That came about through a discussion with the label. We originally were going to be out on tour in January doing a headlining run but Buddy Nielsen and I started talking and decided to do a tour together. The tour starts in late February and runs through March. After that Reggie has some solo shows in early April and then I will be pretty busy with Get Up Kids.